The Albanians involvement slowly but sure in politics in Germany has started giving its fruits. CDU is the party in Germany that he has opened the doors to all Albanians that are talented in politics and active to make changes. 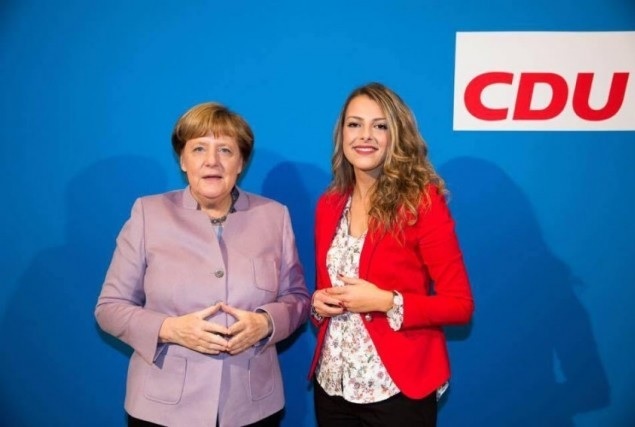 Among those man and women who are making career in German politics it is also the young girl Floriana Igrishta, who belongs to the second generation of Albanian immigrants born, raised and educated in Kiel, Germany. Since 2012 she joined the the CDU and now she is very active. Initially she is activated as a counselor in the district of Mettenhofit, then rapidly advancing in politics, taking the position of Deputy of Women's Forum of the city of Kiel. But the biggest political moment for her came last year when won within CDU to be a candidate for Member of Parliament of Schleswig Holsteini, and to have her electoral area. Kiel has only three constituencies, and to gain a constituency is a phenomenal success. Floriana is the first Albanian in Germany that is a candidate for deputy in Parliament of a German republic as Schleswig Holsteini with her own electoral area. Elections will be held on May 2017 since the preparations for these elections entered the final phase. Albanians in Germany, especially those in the Republic of Schleswig Holsteini should feel happy because now we are a political factor even though Albanians are the smallest community, the fifth community runked by numbers, and thus for her this is a very great achievement. This success did not come by chance but as a result of the Albanian community supporters in Kiel, Germany. April 8 will be the day when posters will be distributed throughout the city of Kiel, which has 246.000 inhabitants where only in the area of Floriana Igrishta are about 90,000 thousand people who will have the opportunity to vote for the candidate of the CDU, Floriana Igrishta . We suggest that all Albanians living in Schleswig Holstein and Hamburg to participate in the rally opening campaign and do not forget that on May 7, 2017 to go to the polls and vote the candidates of CDU of Schleswig Holsteinin, while those living in Kiel have the fate for the first time in the history of the Albanians of Germany to vote an Albanian candidate for the Parliament of Holsteinit Schleswig. The world belongs to the youth, thus we invite all the young men and women in Germany to join the CDU.